Brain Injury: Traumatic Brain Injury (TBI)- Multiple exposure to counter explosives while in the US ARMY 00-11. Explanation of mask: My mask represents the disconnected brain. The loss of high functions (they are “turned off”). Distorted sense (sight and hearing). Brain Injury: Car Accident- A night out with my girlfriend and a few friends turned into a two-day coma, seizure, and blood clot in my left cerebral cortex. My girlfriend was the driver and poorly timed a left turn at a intersection when we were struck my an oncoming car which caused my head to strike the interior with the right side of my head, causing my brain to slam against the inside of my skull. 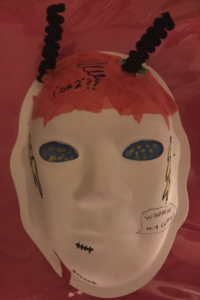 Explanation of mask: The white arrows represent the consequences of the injury to my brain, both internal and external. The arrows depict the conflicting emotions and actions which have resulted, separated by the red line to depict the division. The red line represents the distinction between the internal effects of the injury to my brain, and its external effects. The black arrows represent the external effects and the various ways in which my internal brain injuries manifest themselves in my external daily life. The hopes and dreams of my youth have become the challenges of my adult life. Brain Injury: Traumatic Brain Injury (TBI)- I had two concussions as a teenager from car accident. I also had a concussion from hitting a tree in my 40’s. My TBI was from a horrible car accident when I was 49. Explanation of mask: The black area is where the damage occurred (frontal lobe and left parietal lobe). 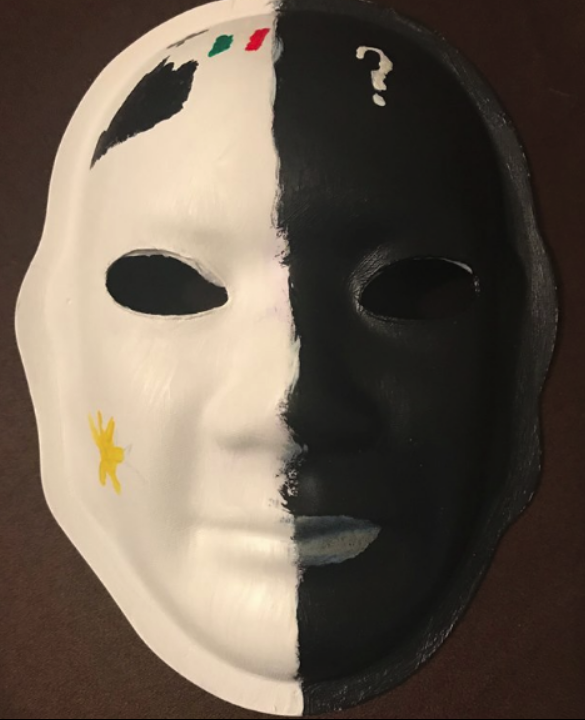 It also represents the many dark time I’ve faced through my recovery. The cross represents my faith which I leaned on during the past 3 ½ years. The daisy represents the happy times I’ve managed to have. Brain Injury: Traumatic Brain Injury (TBI)- fell 15′ onto my head while snow skiing. Explanation of mask: Life completely changed after TBI- lighting bolt represents a split in my life. But I wouldn’t have married my wife if I had not had TBI. Green heart represents how I am back in life again, married 1 year, living in Sun Lake- retirement community. Brain Injury: Traumatic Brain Injury (TBI)- night out with some friends. Had a few drinks and decided to drive my bike home. While driving I got flagged down by the police. Instead of pulling over I gassed it and lost complete control. I ended up crashing into a tree and boom blacked out! Explanation of mask: My mask represents me. 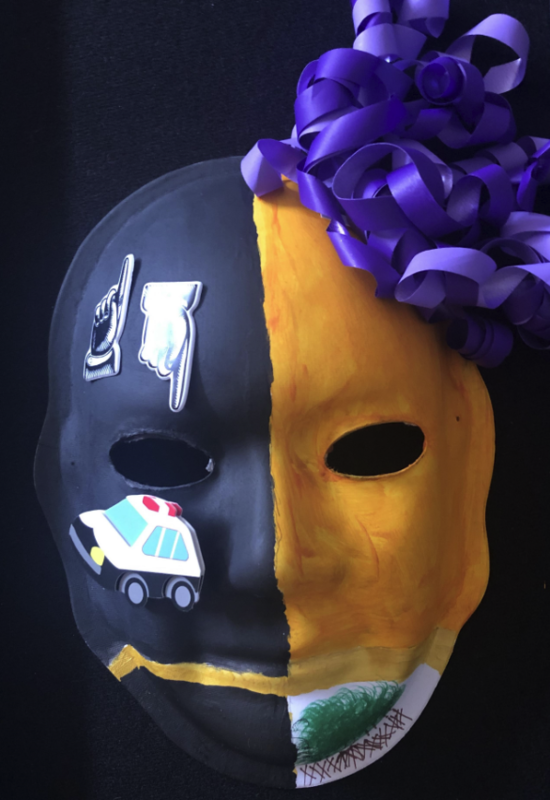 The left side is black with a cop car to represent my accident while the right side of the mask is yellow to show my recovery and my long hair flow before the injury. The tree represents growth over the years while also representing the cause of my injury. There are ups and downs, but I’ve learned to stay anchored through it all! Brain Injury: Concussion & Traumatic Brain Injury (TBI)- I was struck by a car traveling 48mph while in a pedestrian crosswalk. I was thrown 15’ up and 100’ forward. I sustained multiple injuries, some of which I am still recovering from, including a sever concussion and TBI. 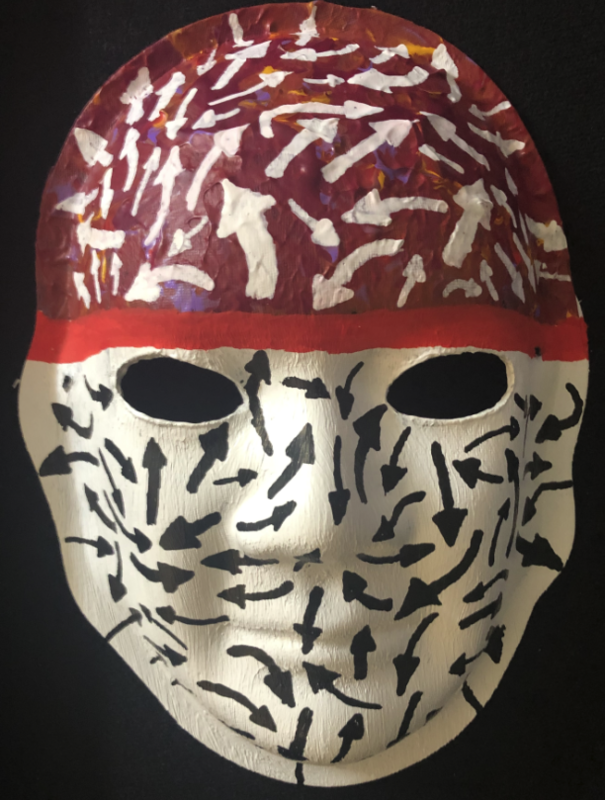 Explanation of mask: My mask depicts my life before and after the accident. Before the accident I lived an active, vibrant life as a yoga and wellness professional. The butterflies represent that I felt free and full of possibilities. Since the accident, which caused nerve damage, concussion and TBI among other injuries. I feel like I live in darkness, robbed of my former life. The words on the right side of the mask express my experience after the accident. The three overlapping parts (the cross, the word ‘strong’ and my smile) represents what has stayed consistent both before and after the injuries. My faith, strength and positive outlook have helped me cope with living with a traumatic brain injury. Brain Injury: (Wife of TBI Survivor) My husband fell while ice skating. He had five hospital stays within two months. Holes were drilled into his head to relieve the pressure and later he needed a craniotomy. 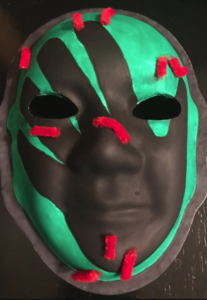 One year after the injury he was hospitalized again with the chronic pain condition, Trigeminal Neuralgia. He has daily headaches and anxiety. Since the accident he has had difficulty in doing tasks that came easy to him during his building career. Brain Injury:Multiple concussions while skateboarding. Explanation of mask: The mask represents my multiple concussions. The red pipe cleaners are in the exact locations where I have shed blood from falls and hits to the head. The back hand covering my face symbolizes “blacking out” and what one does when they hit their head- rub their head. The mask also symbolizes the frustration that this has happened multiple times. I have been skating since I was five years-old and I have had too many concussions to count. I have lost years of my life to memory loss,, but I accept the risks of skateboarding because I love it. Brain Injury: I was ice skating and fell on my chin. I have no memory of the day or anything until a week later. I was in the ICU five time for Burr Holes, drilled to remove blood clots and then finally a craniotomy. Explanation of mask: My mask shows the drill for the Burr Holes and the metal plate for the craniotomy. When I close my eyes I would see orange dots. 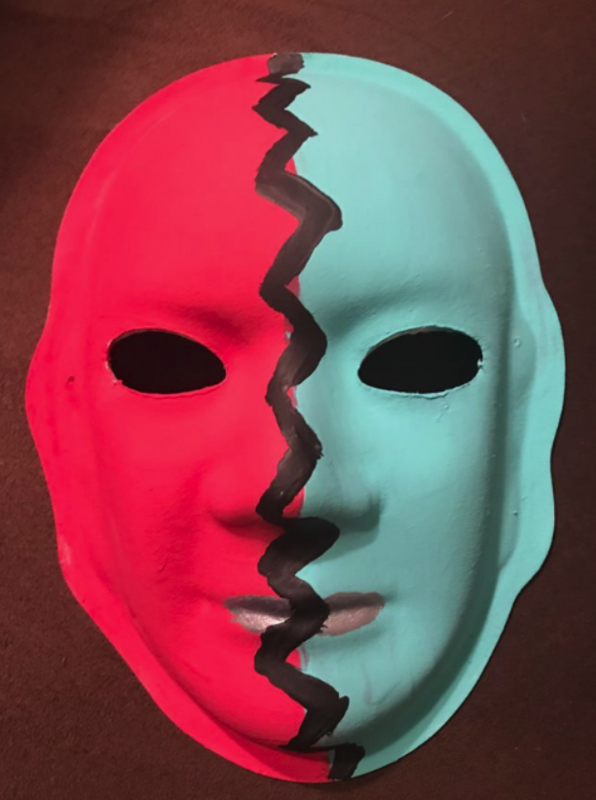 The 1 or 2 ? represents figuring out problems which were easy before. The WHIRLWIND is the crazy feeling that never goes away now. 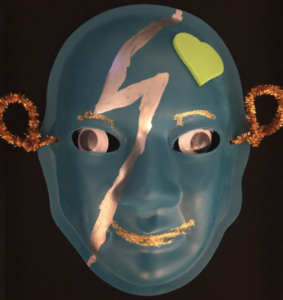 The lightening bolt represents the pain in my head and face The carotid artery shows the tear that has not healed. Brain Injury: I have post-traumatic stress disorder from childhood abuse and sexual trauma that occurred while I was in the military. I have symptoms including hyper-vigilance, flashbacks, anxiety, and depression. 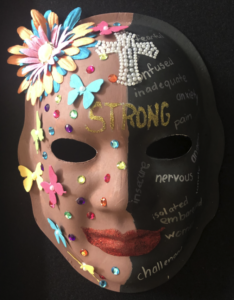 Explanation of mask: The words represent all the negativity associated with living with PTSD. 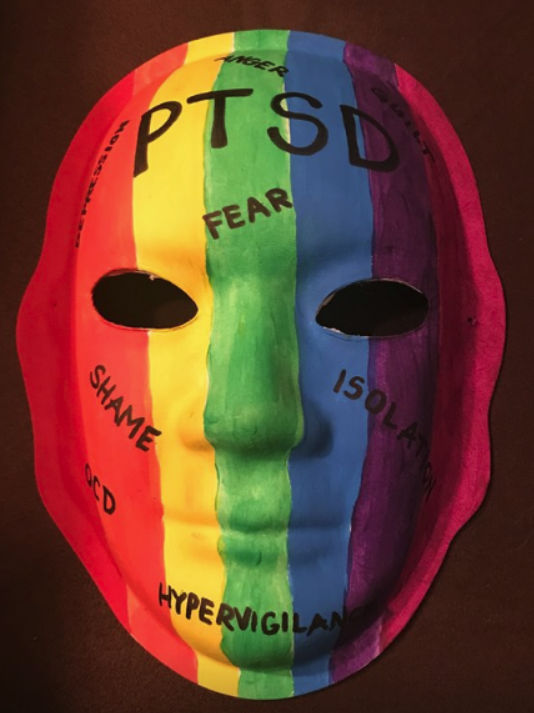 The rainbow colors represent hope and not letting PTSD defeat me. Brain Injury: On January 19, 2008 I was in a near-fatal motor vehicle accident. We rolled eight times and I was life flighted to St. Joes. I had multiple skull fractures and ended up with 45 staples in my head. I also had traumatic brachial plexus injuries (BPIs), which is an injury to the nerves in the neck and shoulder. 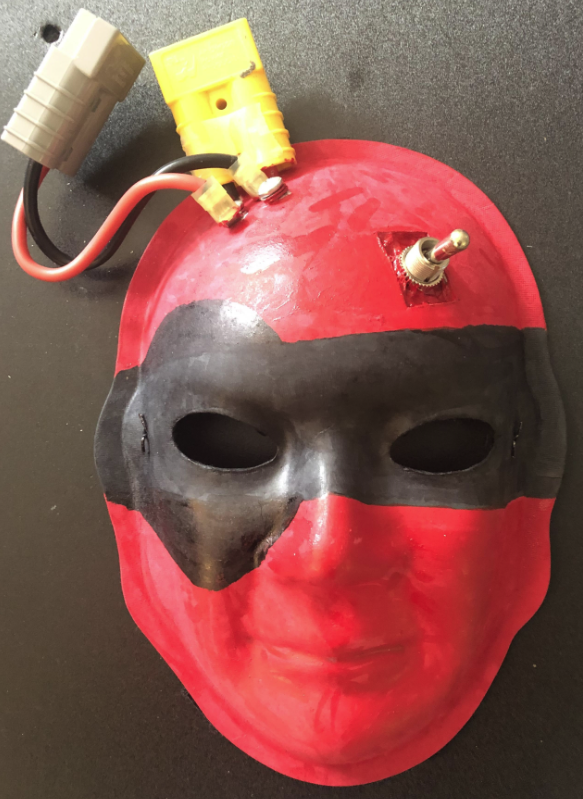 Explanation of mask: Before my accident things were in order and controlled. Then, after darkness. Thru the darkness the light came back slowly. Even though my life is different and difficult, I feel that is when my life began. My healing story is full of miracle after miracle. My faith in God has brought me through and all the doctors and therapists he put in my path. The continued love of and support of my family and friends makes me grateful every day. Even through things are fuzzy, painful, and confusing, I continue to choose joy because I am alive and loved. Thank you. 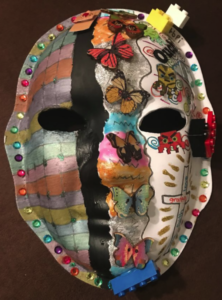 Explanation of mask: We use to travel to Mexico before my wife had her TBI. On the right our future is unknown, but it will be beautiful once we figure it out. Brain Injury: I rolled my car off a hill four times. I hit my head in the process and received a TBI. Additionally, genetic testing revealed I have a progressive neurological disorder, Ataxia. 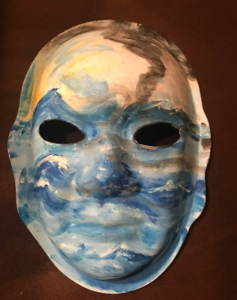 Explanation of mask: I am no longer the person I was. I am broken. I am stuck between the person I was, who I am now, and who I will be when my disease progresses. I fear for my future and for those around me who love and care for me. What will happen when I am no longer able to be a professional, wife, or mother? But, every day I put on a mask and keep going. I will keep doing this for as long as I can. 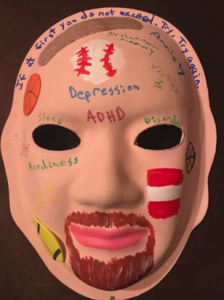 Brain Injury: I have had several concussions from multiple activities, including car accidents, cycling, basketball, racquetball, football, and softball. I have never had a brain scan to understand the damage. 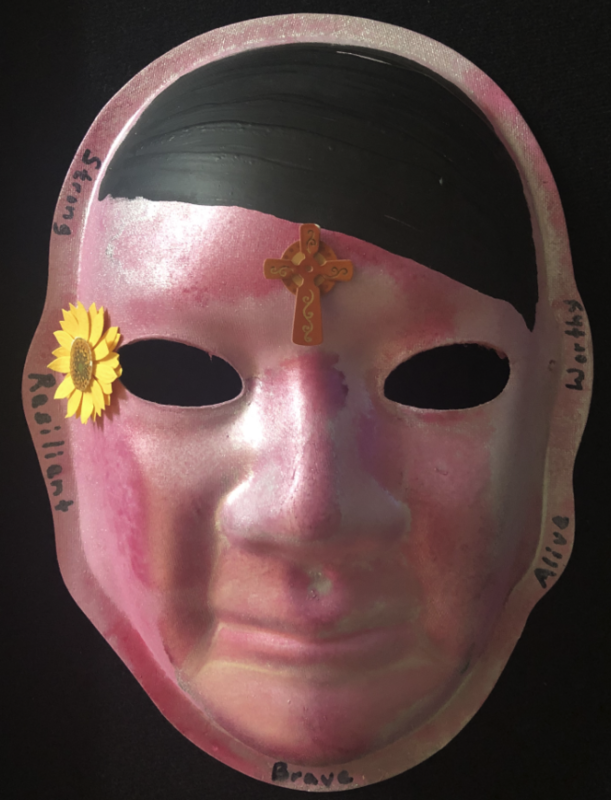 Explanation of mask: I could only think of the realities of all that has happened so I did a self-portrait. I have items to represent each injury. The red and white flag represents the glove box I dented with my head when I was at the age of two. The band-aid is something I always wanted so that people would have a visible cue to know about my disability. The injuries have made me the person I am today. I am thankful for all of the lessons throughout my life, but I would prefer to have had them without the brain damage. Brain Injury: I most likely had an anoxic brain injury at birth. 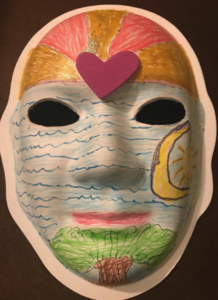 Explanation of mask: The forehead represents connection to the source of energy and my 3rd Eye. The right cheek represents waves of energy and the left cheek is the moon, stars, and universality. We are star dust. The chin is the Tree of Life.